Late November – March is the rainy season, but is one of the best times for game viewing in the Central Kalahari as well as witnessing the Zebra migration in the Makgadikgadi Salt Pans. 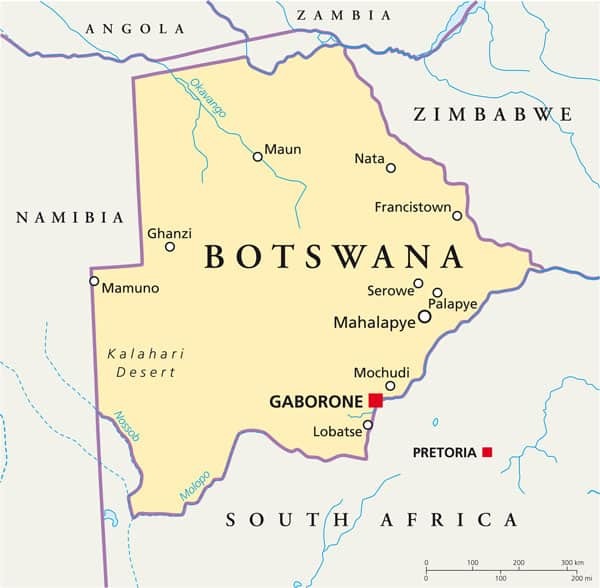 Botswana is a country of contrasts, 80% of the country is covered by desert, while in the north west there is the unique environment of the Okavango Delta. The Delta is a magical water wilderness, and a haven for birds and huge concentration of game. Activities are in abundance from mokoro (dug-out canoe) safaris, boat safaris, walking, horse-riding, fishing, fly camping and so much more. The Okavango River, starting in the mountains of Angola, winds its way across the Caprivi Strip of Namibia, in the direction of the Limpopo. Cut off thousands of years ago, it is now stranded in the Kalahari, forming an inland delta of 7,000 square miles, the largest in the world and recently designated a UNESCO World Heritage Site. In Angola, the rains from December to March swell the papyrus-lined river. The drop in level between the border and the end of Delta is so slight that the water takes several months to expand into the Delta, which it does in the dry season. Up to 90% of it evaporates on the way. 35,000 years ago the Makgadikgadi Pans in the east of the Kalahari were a giant lake. Today, in this often parched expanse, there is an astonishing annual migration of zebra, wildebeest, springbok and gemsbok between November to March, dependent on the infrequent rains. The Kalahari is well worth visiting for a very different safari experience, and one not to be missed by the sophisticated traveller. Here you can trace the evolution and origins of the Delta, see adapted species, and get an understanding of the special archeology and anthropology of the Kalahari and Makgadikgadi Pans. To the north is the Chobe River Valley, much of which is national park and forest reserve. It has excellent game, many other species and a profusion of birds – although it is probably best known for the profusion of elephants. Savuti, southwest of Chobe, was once a huge inland sea in the Lake Mababe Depression. It is thought that a warp in the earth’s crust may have dammed the flows in out and out of this, which together with a drier climate, turned the area into a plain of grass and scrub. The Savuti Marsh, with its forest of dead trees is quite mysterious in its beauty, but fascinating to behold. Savuti’s almost desert-like landscape with a scorching sun, and animals escaping the heat by gathering together in the limited available shade, and elephants lining up to get to the water supply, offer a wildlife experience you won’t easily forget. On a Botswana safari, stay in exclusive tented camps and lodges in secluded spots on the edge of lagoons and banks of the waterways of the Okavango Delta. You will be treated to high quality guiding, excellent service, delicious food and luxury accommodation; often for only a dozen or so people. Activities include game drives in open vehicles by day, and perhaps at night, expeditions by ‘mokoro,’ fishing, fly camping and walking. Botswana with its widely contrasting habitats, seasons and choice of camps can be bewildering. For an exceptional safari, combine water, land and desert camps or for the more adventurous try a horse-riding safari or an unforgettable elephant back safari.